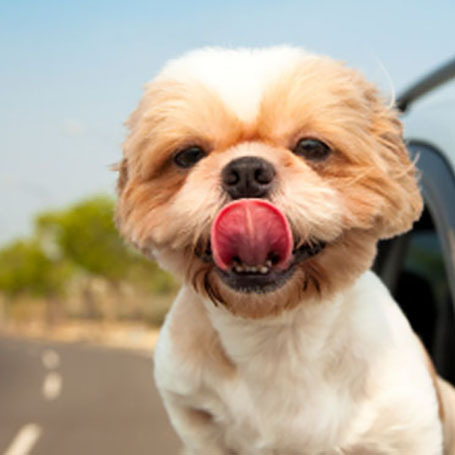 Traveling with pets can be a fun and rewarding experience! However, Syosset Animal Hospital gets frantic calls from our clients regularly because they didn’t take a few easy precautions. Here’s a quick checklist to ensure your trip is successful and stress free. A domestic Health Certification is required by many states and airlines. These ensure your pet has no communicable or regional diseases that may spread to other areas of the country, and are healthy enough to travel safely. Each airline has a different set of criteria to be cleared to fly, so please research the specific requirements that will apply to your pet. Syosset Animal Hospital accredited veterinarians are able to issue Health Certificates to our patients following a comprehensive veterinary examination. If you’re flying on an airplane or leaving the country, you will most likely need a Health Certificate. This document is required by airlines to ensure your pet is safe to travel. It includes updated vaccinations and medical history. Most Health Certificates must be issued within 10 days of travel. Please contact your Syosset Animal Hospital veterinarian for a certification exam. As a USDA-accredited veterinary practice, Syosset Animal Hospital can provide the travel documentation necessary for international travel including, but not limited to, International Health Certificates. If your pet is taking any prescription medications, make sure you take an adequate supply with you to last for your entire trip. Doctors and pharmacies must be licensed in the same state in order for your pet’s prescription to be filled. Take a copy of your pet’s Rabies Certificate. Rabies vaccinations are legally required for interstate travel and proof of such can prevent hassles. If needed, please call Syosset Animal Hospital for a copy of your pet’s Rabies Certificate along with vaccination records. Have ID on your pet. A pet getting lost is scary, even more so in an unfamiliar area. Keep identification with your name and phone number on your pet at all times. If your pet is microchipped, Syosset Animal Hospital will include it on his or her Rabies certificate. Pack a Pet First Aid Kit. Being able to handle minor health issues will save you time and money while away from home. Additionally, in the event of more serious emergencies, it will buy you the time necessary to bring your pet to the proper veterinary professionals.